Certain questions should never be asked during an interview because they are inappropriate. 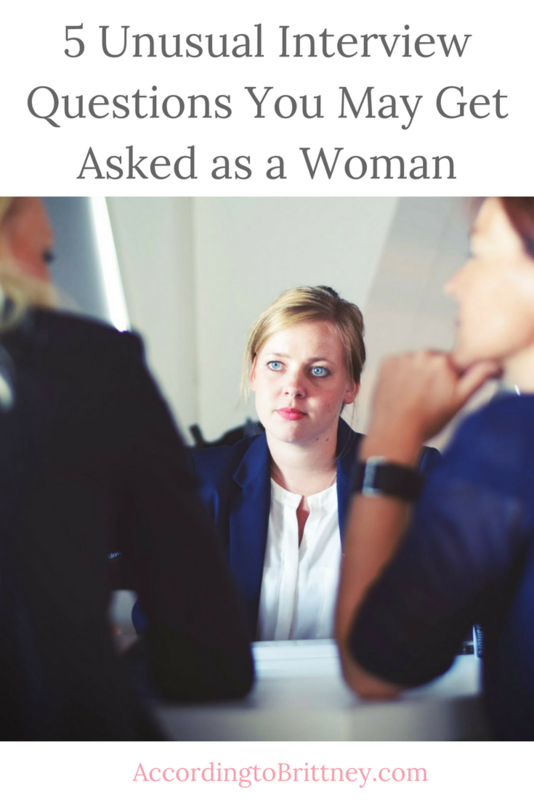 Yet many women experience these inappropriate questions all the time. Questions that are about your personal life or that are gender specific. You need to be prepared to respond in a professional, polite, and tactful manner instead of the eye roll you’d like to respond with. According to a Women In Tech survey Elephant in the Valley, a poll of over 200 women working at organizations such as Google and Apple concluded that “unconscious” workplace bias is a challenge for women in the workplace — even at the Executive level. An astounding 84% of women said that they’ve been told, on at least one occasion, they are “too aggressive”. 88% of women, reported being overlooked in meetings when questions should have been directed at them. A whopping 90% reported witnessing sexist behavior at company related events and conferences. While you may not be able to change this behavior right away, awareness can lead to better work relationships and change in work structure. How Many Children Do You Have / Do You Have Children? Whether or not you have children and how many children is irrelevant and has zero to do with your ability to perform your duties at work. The company is trying to assess the future probability of your kids interfering with your work schedule. Like how often you’ll arrive late (because you had to get the kids off to school) — or if you’re capable of putting in extended hours. Answer: How you choose to answer this question should depend on your personal situation and if you want to divulge this information or not. You could answer truthfully or steer the topic away to focus on your talents. Here’s an example, “I love kids. I coach volleyball because I believe in being a positive role model.” If you do have children and choose to disclose it, be prepared for follow-up questions. Whether you’re married should be obvious because you’re either wearing a wedding ring or you’re not. If you are married the question is explicitly being asked because it precedes a follow-up question. Again, the company is attempting to gather personal information to get a better idea of your reliability and potential life path. Who Will Watch Your Kids While You Work? Use caution when discussing your childcare plans because you simply can’t plan for the unexpected. If asked, it’s important to demonstrate that you have a solid childcare plan. You’ll have to work that much harder to show that children won’t be distracting you from your responsibilities. Answer: In addition to routine childcare/daycare, discuss the family support system you have in place for emergencies including any nanny, husband, family members, or after-school programs. There is wisdom in the adage “never discuss politics or religion at the dinner table.” Your political and religious beliefs are personal and private. This definitely crosses a line, and you are not obligated to respond. Do You Get Along With Men Easily? In a closed interview setting a question like this one could feel intimidating and awkward. However, some industries are male-dominated and for that reason, the interviewer may want to “ruffle your feathers” or test your reactions. If you’re hired, you could get caught in an unconsciously sexist scenario with a male coworker and you will be expected to handle such situations with professional decorum. Answer: Focus on both sexes equally in your response and point out that you get along with everyone easily. You can even mention that you’re comfortable working in small groups, as well as lecturing before larger audiences. If you have experience in networking mixers or industry conferences, mention those as well. Not all potential bosses are used to equality in the workplace. Women who are striving for respect and power in their industries have to be much more tactful than men. Wait until after you’ve been hired to start challenging sexist comments. It’s also perfectly acceptable to leave an interview or turn down a job if you feel that the questions are inappropriate. Be prepared for these questions and ace any interview — no matter how behind the times a company may seem. What ridiculous interview questions have you have to answer? This post was written by Jordan Perez of Resume Pundits. Check out her website for more!